If you could only use one word to describe Marblewood, that word would have to be hard. This stuff is seriously the hardest wood I’ve ever worked. The first time I tried to make a set of dice with it, it snapped a 1/4″ carbide endmill designed to cut titanium! While technically not the hardest nor densest wood around, that distinction belongs to lignum vitae, Marblewood is hard like well… like marble. Originally, I thought its name was due to the marbled streaks of dark running though the generally creme colored heartwood. Nope, they call it marblewood because this stuff is as hard as a rock. Marblewood can be found in the North Eastern part of South America and is related to Tiger Caspian, which grows in the Southern regions. It’s mainly exported for use in flooring or other uses that would require a high resistance to wear and tear. 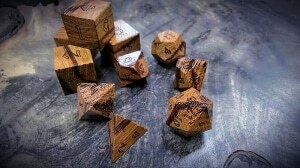 Sorry if this is a silly question but what dice come In the 10 dice polyhedral set? Wow I wish I wasn’t poor haha. Do you offer different coloring for the numbers on the dice?